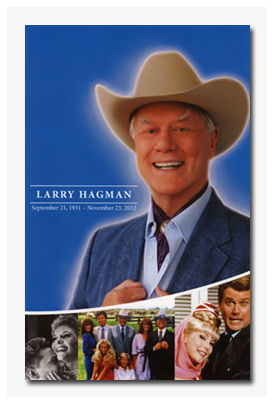 This is the memorial program that was given out at Larry's two memorials, at Southfork and in Los Angeles. Color eight page program features a biography and photos of Larry and his family through the years. Measures approximately 5 1/2 inches by 8 1/2 inches. Each memorial program sells for $10.00. Order your memorial program using the below PayPal button.